Visitors to Europe expect to see sites such as the Eiffel Tower, the Colosseum and remnants of the Berlin Wall. Probably most also are little surprised to see homeless individuals on the street. Sitting left to right, Jim Brooke, Phay Siphan, Denise Coghlin, Billy Tai. 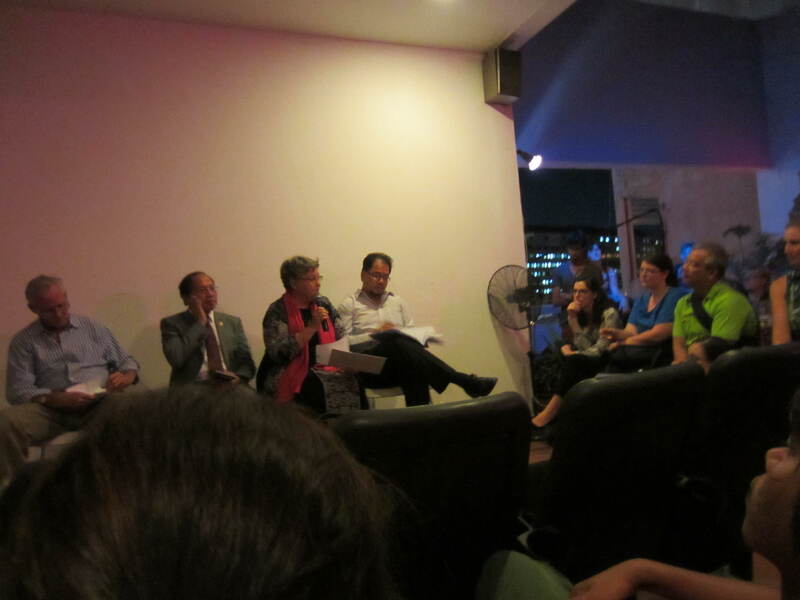 During a panel discussion last week, four individuals failed as expected to arrive at unanimous agreement about the world’s refugees in general and, in particular, the four who have arrived in Cambodia from Australia. Former New York Times journalist, Jim Brooke, a friend who is editor of the year-old Khmer Times newspaper, stuck to the theme of a column in which he denigrated the men, women and children who braved the perils of crossing the high seas to enter Australia from distant shores. Those souls have made it only to the independent nation of Nauru, where some 1,000 of them are held in a detention center run by Australia in what are described as deplorable conditions akin to a concentration camp’s.